In Part 1 of this article, we discussed the tension of structural joints and external tensile loads applied to joints and the effect on bolt tension. The third least understood truth, sizing fasteners, will be revealed in this final installment. What follows is more of what you always wanted to know about bolted joints but were afraid to ask! 3. When sizing a fastener for a given application, the saying, “When in doubt, make it stout,” is a guideline you should throw out. 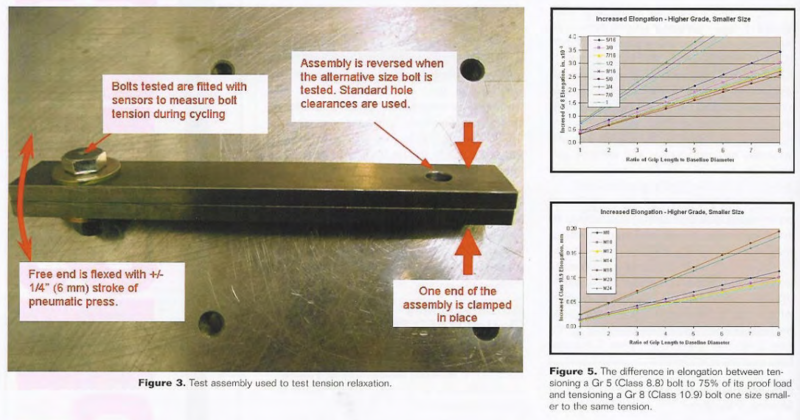 Typically, unless one is designing products where the cost of failure is high, the detailed analysis and testing required to determine joint loading is not performed, and therefore the quantitative basis of how to size fasteners is limited. 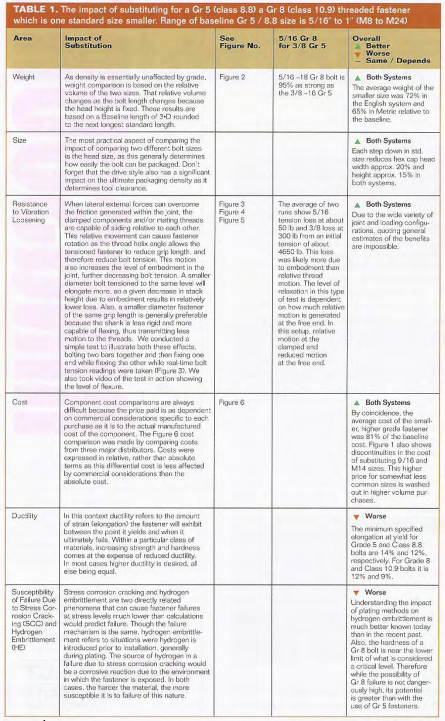 Even when the best analytical and test techniques are used, there is always uncertainty as to how well the analytical assumptions or the test protocol replicated actual use conditions. It is therefore common to apply some type of safety factor to the assumptions that go into threaded fastener sizing. 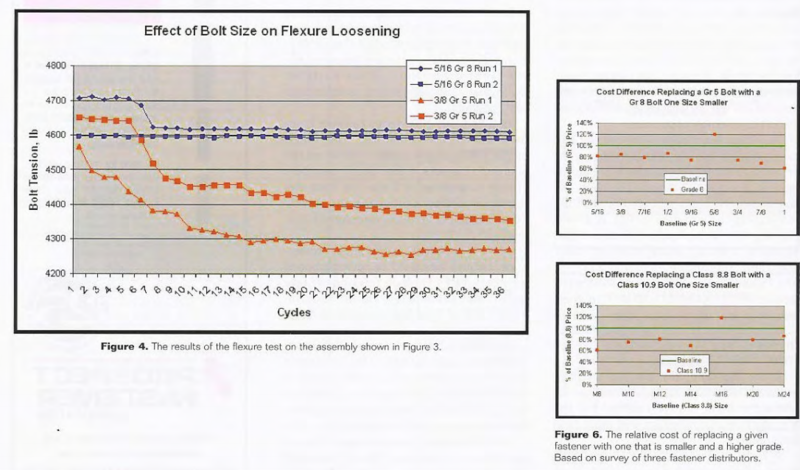 While they often produce the same result, in some cases the engineer applies a factor to the assumed loads from which bolt sizes will be calculated, while in others the engineer will simply use the next biggest fastener. Often the latter approach is used when there is no load data available and the joint is being designed based on a product currently in the field. In either case, on the surface it seems a reasonable assumption that if big is good, bigger is better and safer. Actually the opposite is often true. The primary methods of varying bolt strength are its size and the material from which it is made. 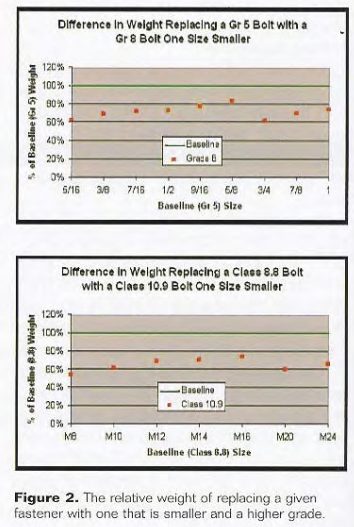 For example, a Grade 8 bolt obviously has greater capacity than a Grade 5 bolt of the same size (in the metric system, property classes 10.9 and 8.8 are the near equivalent of Grade 8 and Grade 5, respectively). But what if we don’t need greater bolt strength and simply want to optimize the joint at the existing strength. 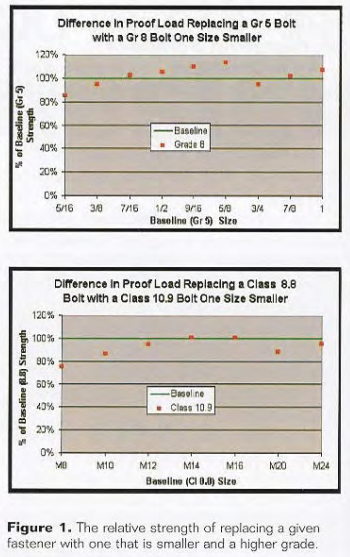 One option would be to use a higher grade bolt than planned, but reduce its size to yield the same capacity. This is the option we will explore in Table 1. The contents of Table 1 reinforce the axiom that one should strive to use the smallest diameter fastener with the largest L/D ratio possible.